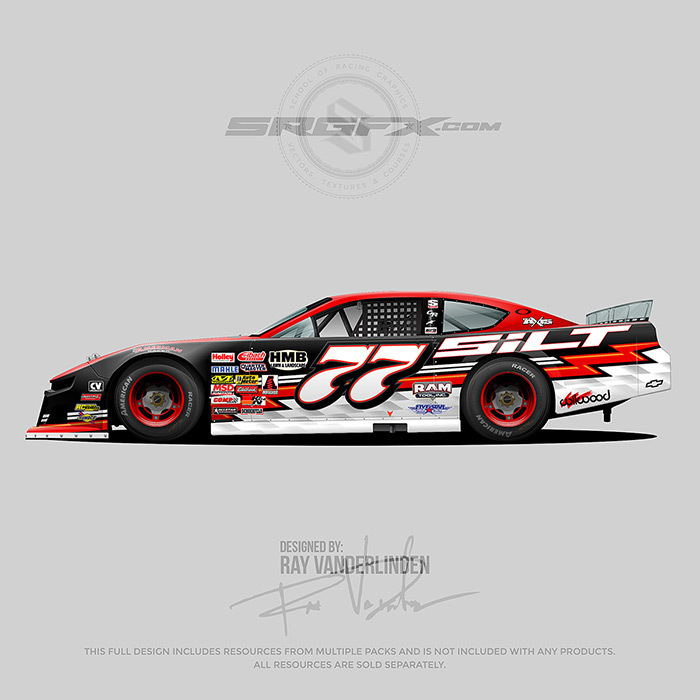 A red, white and black number 77 Gen 6 Super Asphalt Late Model vector racing graphic wrap layout. All resources for this racing wrap design are available at schoolofracinggraphics.com. With 15 years of experience in the professional graphic design world, I began creating racing graphics for the sim racing community. Shortly after I began to simultaneously freelance design while working full time at a print shop. SRGFX packs are high quality graphics that are a product of my combined experience and my passion for racing. WHAT TYPE OF GRAPHICS ARE YOU LOOKING FOR? Browse graphics by racing type! Under no circumstances should SRGFX resources or accounts be shared, traded or co-owned. All purchases are licensed to the single owner(1 user) of the SRGFX account. Unless given written consent. Piracy is a serious federal crime, and we(SRGFX) will pursue legal action to the fullest extent on those who infringe or ignore our terms and conditions. A customer IP address is recorded with every order. We understand from time to time an IP address will change or reflect differently when traveling outside of your regular work station or office. However, if we(SRGFX) at anytime suspect fraudulent or suspicious behavior, we(SRGFX) reserve the right to freeze the perpetrators account until further review. If any malicious action has been discovered, the perpetrator will be contacted.